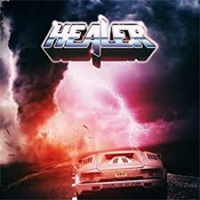 At first listen HEALER sound anything but sons of Germany, the band loads you into a time-machine which brings you on a trip through the late-seventies and early-eighties era of glam-metal. For their latest release: “Heading For The Storm”, it shows the vision of a band who has hit the ground running once again, settling for a raw-savage sound in the twenty-first century, an approach in itself which is more than welcome. “Desert Star” is a stuttering-guitar opener, Michael Scheel’s vocals are somewhere between the late Bon Scott and Klaus Mein, grime-ridden when they need to be whilst magnificent when they soar high. The title track starts with the lash of rain and some decent feedback screams before opening up fully. A little over-use of the keyboards is smothered under the sound of drums and bass, HEALER can rock-out with the best of them, on “What Lovers Do” the listener old enough or not, is brought with a bang back to 1984, nostalgia is running wild through the veins of this band and that is not a wholly bad thing. As “Strangers Of The Night” kicks off with drummer Christian Demter sounding very Peter Criss, this is one of the highlights of the ten-tracks. Whereas “Same Old Road” opens as if the start of some John Carpenter movie soundtrack and continues with that flavor. Having their own personal battle-cry in the track “Healer” it gives an extra dimension to the album, an insight into this very unique band, unique in the sense that they are making an album that is something they would personally listen to and they are obviously enjoying making. The ominous, organ opening at the start of the brilliant “Rolling Thunder” is the right sound at the right time. This is the pinnacle of the album, the great moment you knew was coming along the line, HEALER have the engine opened up in full. Starting with a motion of intensity turning to reflection and then opening up again. The guitar sound against a choral effect is staggering, the pipes of Scheel are spectacular here, and we have seven-minutes of pure metal-ecstasy. After a few listens it becomes apparent as to how HEALER have connected with such a rich, old-school sound, the drum track is the heart of the album, not the firing -double bass attack but a more solid sounding rock affair. A brave move but one which has paid off here stylishly. There is nothing new or any reinvention going on within “Heading For The Storm”, however it is a damn fine album that flows effortlessly across ten-tracks of metal-splendor, if ain’t broke, don’t fix it and that is the approach of this band.